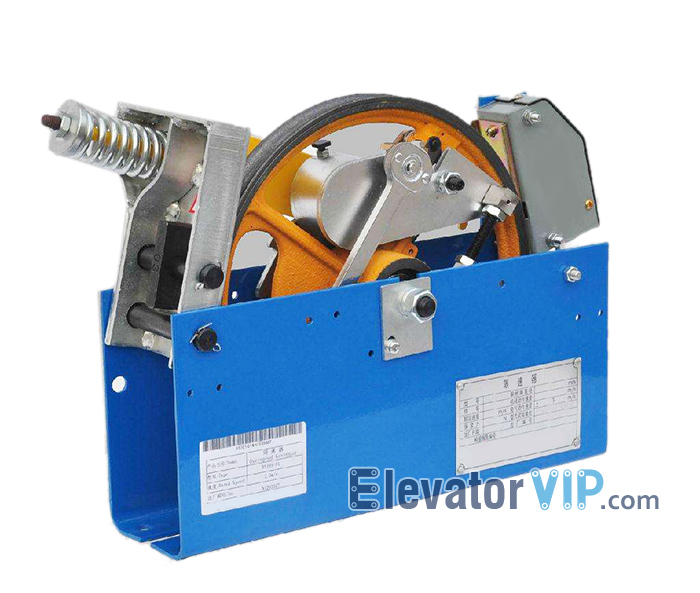 Elevator safety gear is a mechanical device, which stop the car (or counter-weight) from moving. Safety pliers are required for any manned car suspended by a wire rope or chain. When there is a passageway or space under the bottom pit, a safety clamp is also required for the weight. The safety clamp is set on the beam under the cage frame and ACTS in pairs on the guide rail at the same time. A speed limiter is a device that limits the speed of a car (counter-weight), and usually installed in the machine room or at the top of the well. The tension device is placed in the bottom pit. Safety gear and speed limiters must be combined to work. Speed limiter can be divided into swing hammer type and centrifugal type according to its action principle. Hem hammer speed limiter is to use the CAM on the rope wheel in contact with the roller at the end of the pendulum in the process of rotating, the frequency of the pendulum swings associated with rope wheel speed, when the vibration of the pendulum frequency exceeds a predetermined value, the pendulum of the ratchet into rope wheel stop stop claws, so that the speed limiter to stop running. The speed limiter of centrifugal structure can be divided into vertical axis rotating type and horizontal axis rotating type. It is characterized by simple structure, high controllable ability and small space required for installation. 4). The response time of the limiter action should be as short as possible. It features a short braking distance and a strong impact on the car. It is characterized by elastic clamping of the clamping body, long stopping distance and stable car. Posted in Technology and tagged elevator counter-weight, elevator instantaneous safety gear, elevator knowledge, elevator parts, elevator progressive safety gear, elevator reducer, elevator reducer action principle, elevator safety gear, elevator speed limiter.